This time Hamid Karzai will issue a very stern warning. Hamid Karzai is now angry. Hamid Karzai means business. 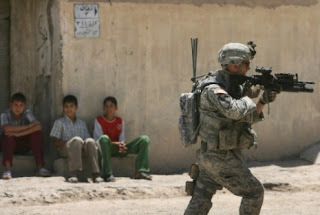 "Air strikes in the British-controlled Helmand province of Afghanistan may have killed civilians, coalition troops said yesterday as local people claimed that between 50 and 80 people, many of them women and children, had died." I am told by sources in Syria that my blog was blocked two days ago. Let it be noted that I found Soy Milk in Islamabad (but not Vanilla flavor). Yesterday, I was told that all the street sweepers, cleaners, and servants in Pakistan are Christians. That they were former Hindus who converted to Christianity to escape caste, only to face a rigid (albeit unofficial) caste system. This is really bothering me. Outside of my hotel, there is a man who spends the whole day (he works for the hotel) on his hands and knees, cleaning (with a broom) the...grass. Who come up with those jobs except capitalism? ""There are serious concerns about our ability to recruit quality sources in the future," the spy master said." "At a mosque in the West Bank city of Ramallah on Friday, a preacher taunted his Fatah rivals in his weekly sermon. Two police cars were parked outside the mosque during the sermon. In the West Bank city of Jenin, a pro-Hamas preacher was replaced by a clergyman who spoke of the need to support the new Palestinian government, headed by Fayad." "“People fear they will never be able to return to the camp because of the level of destruction. They live here in hard conditions, sometimes 50 or 60 in one classroom, and wait in long lines to use bathrooms,” said Abu Jihad, an official from the mainstream group Fatah, who spoke by telephone from his home in the Beddawi camp. “They want to go home, to their camp.”"
"Four civilians were killed early Friday by American and Afghan forces in eastern Afghanistan, according to the leader of a small human rights group who gave an account of the deaths entirely at odds with that of the United States-led coalition. “The soldiers claimed they were looking for three Taliban suspects, and they blew out the door of the house that belongs to Haji Muhammada Jan, who was about 80 years old, killing him and two of his sons and a grandson,” said Lal Gul, chairman of the Afghanistan Human Rights Organization and a resident of the area in Nangarhar Province where the killings took place. “There were no Taliban here.”The American-led coalition offered a markedly different version, saying its forces had been fired upon after “credible intelligence” led them to three separate compounds suspected of harboring Taliban fighters."" Today, during the second day of a three-day peaceful protest in the Palestinian refugee camp of Badaoui in solidarity with Palestinian refugees from Nahr el Bared, the Lebanese Army opened fire on the protestors in Badawi refugee camp, killing two people and injuring 3 5, 7 critically. 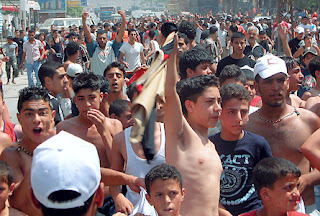 A peaceful protest began within the Badawi Palestinian Refugee Camp in north Lebanon. The protestors had signs reading “Nahr el Bared is in our soul” and “Nahr el Bared, we won’t forget you.” The protestors were calling for an end to the violence. Energetic male youth continued the protest outside the camp, against the wishes and attempts of the organizers. As they proceeded towards the Lebanese army's checkpoint, the army issued verbal warnings telling the protestors to stay away. At this point, women and children raced to the front to try to prevent the army from firing upon the crowd. The Lebanese army shot two warning shots into the air and then immediately responded with machine gun fire at the crowd of approximately 300 peaceful protesters. The army continued firing on people as they were attempting to retrieve the wounded. A senior official in the Lebanese Army stated that the Army responded in this way to defend itself, and that its response was the minimal response it could have undertaken. Two civilians were killed, and 35 wounded, including 5 women, one elderly sheikh, and 7 children below the age of 15 – including one 3-year-old child. Seven of the wounded are critically wounded, having been shot above the waist. Mirvat, my sister, sent me this: "I just received a phone call from Baddaoui [refugee camp]. It seems a half an hour ago (around 3.00 am Lebanon time), displaced population from Nahr El-Bared (and staying at Baddaoui) went on a demonstration heading from Baddaoui to El-Bared to protest their current conditions. The Lebanese Army shot them like birds at a distance of 10-15 km away from Al-Bared. First information said aoround 20 wounded and 7 dead." I have arrived in Islamabad. I may be able to blog tomorrow, after I get my 24 hours of sleep that I so desperately need. "Three years ago, I was catching a plane at Boston’s Logan airport and went to buy some magazines for the flight. As I approached the cash register, a woman coming from another direction got there just behind me — I thought. But when I put my money down to pay, the woman said in a very loud voice: “Excuse me! I was here first!” And then she fixed me with a piercing stare that said: “I know who you are.” I said I was very sorry, but I was clearly there first." Fath official, Husayn Ash-Shaykh, was holding a press conference--Al-Arabiya TV carried it live of course. He went on babbling and I did not know what he wanted to say. After talking for a while, it got to the point: it was an attempt to respond to Hani Al-Hasan. He is one of the main founders of the movement, and his statements on AlJazeera (to the effect that Hamas went to war against collaborators) were quite damaging, as you can tell from the angry statement by Ash-Shaykh. 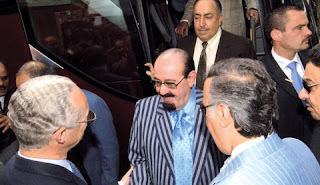 Al-Hasan has not been tainted by corruption: a rarity among Fath leaders, and he has been quite displeased with Oslo. (For the role of Al-Hasan in Fath, read Helena Cobban's The PLO). Hayfa Wahbi reveals: she was saved from an accident by divine intervention. "Throughout this period, Bakhtin was at work on the doctoral dissertation that was to become Rabelais and His World; and in 1946 he submitted the work for examination. His examiners took offence at its scatology, sexual explicitness, folkloric sentimentalism and scorn for dogma, and he was granted the degree only 12 years later. It was not until the 1960s that his gradual rehabilitation got underway, partly through the good offices of the Formalist scholar Roman Jakobson." I find something very fishy about the coverage of Ashraf Marwan's death. First, you find this sudden sympathy in the Israeli press for this Arab. Secondly, there is something very suspicious: none of the articles in the Arabic or Western press have talked about Marwan's relationship with Kamal Adham--the Saudi intelligence chief during King Faysal's reign. Those two constituted an influential team playing a role similar to that played by Bandar these days (prior to the bribery scandal. I heard that the US Justice Department is investigating the scandal. Let me guess. No evidence of wrongdoing will be found. And Bandar will be officially declared the most honest and transparent official on the face of the glob). Also, Ashraf Marwan's son, Jamal, owns the Melody Arabic music channel. "U.S. commanders plan a summer of stepped-up offensives against Al Qaeda in Iraq as they tailor strategy to their expectation that Congress soon will impose a timeline for drawing down U.S. forces here." "President Bush announced plans yesterday to appoint an envoy to an organization of Islamic nations with the intention of improving the battered image of the United States in the Muslim world." (Top candidates: Irshad Manji or Salman Rushdie). It is not true that there is no sympathy for Arabs in the Israeli press. I detect plenty of sympathy for this Arab...Mossad spy. Image of US around world. "An Egyptian billionaire financier who feared for his life after being accused of being a Mossad spy was found dead outside his Mayfair flat yesterday in suspicious circumstances." "The Gaza events were not a war between Fatah and Hamas; but between Hamas and Fatah collaborators who served the Americans and the Israelis, said a senior Fatah advisor on Wednesday. Hani al-Hassan, the Palestinian president's senior political advisor and member of Fatah's central committee said in a TV interview that what was happening in the Gaza Strip was the defeat of to plans of American Major General Keith Dayton and his Fatah followers. Al-Hassan's words severely discredit Palestinian President Mahmoud Abbas and other Arab leaders' claims that the Gaza takeover was a coup against Palestinian democracy." My article in Al-Akhbar: "Islamic Rule in Gaza? Oh, What Horror"
Appointing Tony Blair as Middle East envoy is as offensive as electing Fouad Ajami as president of MESA. 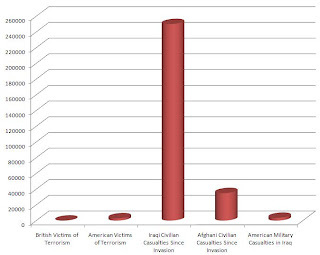 There is no question that Arabs and Muslims in UK feel more free and less constrained than Muslims and Arabs in US. I was walking down the street on Edgeware Road and saw this man who looked--well, like the stereotype of an Al-Qa`idah member (of course, the stereotype is not accurate or fair, but you get the point)--and he stood at a street corner holding a bucket on which is written: "School (wait, that was actually maadraaassaaa) for Qur'an Memorization." I could not help but compare that to the US. I actually stopped and looked at him in amazement. In the US, he would last for a few minutes before the police would be called in. Serious. I can actually see Irashad Manji chasing him down yelling: Maaaaadraaasssssaaaa! I read the statement by Marwan Barghuti. He called on Israelis not to miss "this opportunity." What opportunity do you have in mind, Mr. Barghuti? This only confirmed my suspicions. I was suspicious of his "arrest" and will be more suspicious of his release. 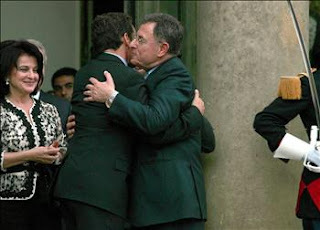 "Bolton: I'm 'very worried' for Israel"
There is no leader--if that is what Fu'ad Sanyurah is--in the world who hugs other leaders more tightly and more affectionately than this dude. (Notice how proud his wife looks). Dazed and Confused. "The CIA was eager to examine the use of dangerous pharmaceutical drugs to modify the behavior of targeted individuals, and so it asked commercial drug manufacturers to pass along samples of medicines rejected for commercial sale "because of unfavorable side effects," according to an undated memorandum included in dozens of CIA documents released today. CIA scientists tested some of the drugs on monkeys and mice, the memo said. Drugs that showed promise, it said, "were then tested at Edgewood, using volunteer members of the Armed Forces." This appears to be a reference to the Army's laboratory north of Baltimore now called the Edgewood Chemical Biological Center. It doesn't discuss the reactions of those human subjects." Lie of the Year. Egyptian foreign minister, Ahmad Abu Al-Ghayt, told Al-Arabiya (he is interviewed at the station probably twice a day) that the Sharm Ash-Shaykh summit did not in any way deal with the internal Palestinian situation. He also said that Husni Mubarak is the most loved leader in the world. He also said that his government is not talking to Hamas, but that Hamas officials keep initiating contacts with Egyptian officials. The colonizer and the colonized. It is amazing how the native can internalize the thought of the colonizer. I was just reading this news item in the Iraqi newspaper, Az-Zaman. It said that famed Egyptian belly dancer, Fifi `Abduh, received "the title of Best Eastern Dancer in the World in a ceremony that was held in the state [sic] of Dallas under the supervision of Mrs. Didi, the director of the most famous institute for dance in the US..." I mean, why would Fifi `Abduh, of all people, need the approval of Mrs. Didi? (p. 19 of the newspaper). "Each man questioned the other's sanity. Nixon told a top aide to keep a file on Mr Kissinger's mental health. For his part, Mr Kissinger, obsequious in the presence of Nixon, in conversations with journalists would refer to Nixon as a “madman”, “maniac” or “meatball mind”. The insults went further. Nixon called Mr Kissinger his “Jew boy” behind his back and, occasionally, to his face. Mr Kissinger would remain silent or even support Nixon's anti-Semitic outbursts....Among Mr Kissinger's unguarded comments are his reference to the North Vietnamese as Russia's “little yellow friends” and his advice to Hafez Assad, the brutal president of Syria, that their mutual goal should be to avoid a situation that helped “the Jewish newspapers in the United States”." "Most think the Army of Islam is just a front for a criminal gang; that may apply to many of the bombings too. But it all adds to the sense that Gaza is beyond the PA's control. If the Palestinian unity government crumbles and Israel can hold back from a massive military operation, it could open an opportunity for Mr Dahlan, who has been quietly restoring his political influence after a period out in the cold, to make a new bid for increased power. Hamas hates Mr Dahlan; but some security-minded Israelis think he is a man they can do business with." I hate Heathrow airport. The smallest airport in Nebraska is more convenient and more logically designed. And US, Germany, and Sweden are much cleaner than UK. Why is that? What happened since I left the US? Is Mr. Bush still making progress in Iraq? And New TV (through Slingbox technology, I can access my TV back home (and even recorded programs on DVR) from anywhere around the world--is technology not amazing?) reported that the Lebanese Army advanced 100 meters in the Nahr Al-Barid camp. I kid you not. They reported that, in those words. Don't think that silly obsession with Paris Hilton is an American phenomenon: I arrived to London to see BBC airing a segment on the release of Paris Hilton from jail. More later. I saw the scene of that summit in Sharm Ash-Shaykh. The Jordanian king referred to the clashes between Hamas and Fath as an "opportunity." And there are still people in the (Saudi) Arab media who mock conspiracy theorists. Their mockery is part of the conspiracy, I claim. But I could not help but think that all the Arab leaders gathered belong at a different side of the table: they all should be sitting behind Olmert. That is their logical place. (Unfortunately, that could have been arranged if the Muslim and Arab masses have not been more distracted by Danish cartoons and knighthood of Salman Rushdie). As for Muhammad Dahlan, he does not belong behind Olmert. Dahlan knows his place. "The Shiites of Iraq had risen, they had come forth with their grim tales of what they had endured during the long night of Baathist despotism, but the Palestinians remained hostile to the claims of the Shiites. 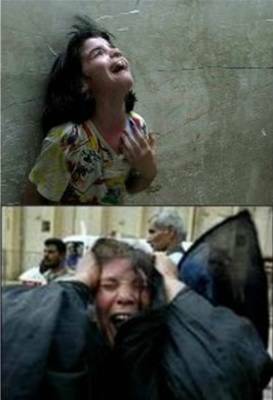 They seemed to begrudge those tormented people of Iraqtheir moment and the right to their own grief." This man's venom against the Palestinians does not end. What does the Palestinians have to do about Iraq? They have to support the Bush Doctrine as he has done? 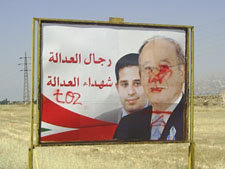 And do you notice that Ajami does not see other (non-Shi`ite) victims of Saddam? And also, can you imagine a social scientist of any other region in the world, writing such drivel: "National movements are often carried away by delirium, their politics can become deeds of self-immolation, and the Palestinians have come to embody the suicidal streak of mass-based nationalism." "U.S.-led coalition and NATO forces fighting insurgents in Afghanistan have killed at least 203 civilians so far this year — surpassing the 178 civilians killed in militant attacks, according to an Associated Press tally." 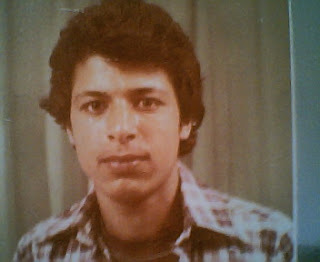 Does anybody know if there was foul play in the death of Khalid Yashriti in 1970 in Beirut? I heard rumors, but don't know for sure. For `Arafat who ordered the murder of cartoonist, Naji Al-`Ali, it would not be a stretch to order the murder of a colleague of his. "Cheney and his allies, according to more than two dozen current and former officials, pioneered a novel distinction between forbidden "torture" and permitted use of "cruel, inhuman or degrading" methods of questioning. They did not originate every idea to rewrite or reinterpret the law, but fresh accounts from participants show that they translated muscular theories, from Yoo and others, into the operational language of government." Rami Al-Amin now writes poetry (and prose) in Hariri media--he calls himself "liberal." It is trendy for right-wing fascists in Lebanon to refer to themselves as "liberal." Even fascist Jubran Tuwayni referred to himself as "liberal." Here, Al-Amin has his poetry published. Sample (this is a full poem): "Before I die; I want to go to the bathroom; real bad." This passes as poetry in An-Nahar. By the standards of the right-wing newspaper, An-Nahar, the "cultural supplement" is considered "left" of the paper. Here, columnist, Raymond Jbara says: "the people shall expose their testicles and treat appropriately those traitors, enemies of Lebanon." This passes as political commentary in An-Nahar. I like it when Fath and other Saudi voices complain about Al-Jazeera's tilt toward Hamas? Is there a tilt? Well, yes Aljazeera covers the views of Hamas rather extensively. But Al-Arabiya's bias in favor of Fath is so much more blatant and so much more unfair, than Aljazeera's bias in favor of Hamas. So my message to Saudi media is this: who are you kidding? ...off to London. Tomorrow my trip shall begin: London, then Islamabad, then Istanbul (then Beirut? ), then London, and returning to US on July 18th. (I envy people who can travel around the world non-stop. Me, I am a big baby. I need to rest a night or two--at least--in London, before I continue to anywhere else, and the same on the way back). I shall take my travel laptop this time but don't know how much I will blog. In Lebanon trips, I don't have much time, but expect to write more if I don't go to Lebanon this time around. I am told that my blog is not accessible in some places in Pakistan, I will examine that. I will be giving public lectures at universities in Pakistan, and I will try to post information on that here. Saddam Husayn's daughter, Raghd, never fails to irritate me when she speaks. Today, she offered criticisms of Arab media. Yes, Raghd: your daddy established a model for media liberties. I understand why you are a stickler for freedoms of the press. You read this interview with Mahmud Zahhar and you find yet another reminder why leftists and secularists can never be allies of Hamas (and for many reasons). (Of course, one should also be opposed to Fath--but opposition to Fath is now part of our opposition to the Israeli occupation). I saw Ahmad `Abdur-Rahman defending Abu Mazen on Al-Arabiya TV. He now holds a senior position in Abu Mazen's structure of power. 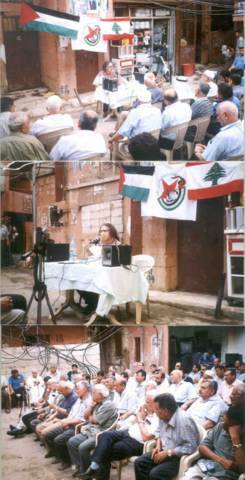 I knew `Abdur-Rahman in his Lebanon days, when he was editor-in-chief of Filastin Ath-Thawrah (the mouthpiece of Fath). I used to tell him that his newspaper was unreadable--it was. I took a graduate seminar with `Abdur-Rahman at AUB taught by Walid Khalidi. Once, we were supposed to read a book by Hans Morgenthau (Politics Among Nations). We came to class, and Khalidi asked us what we thought of the book. `Abdur-Rahman said: "Bad. Very bad." Khalidi asked him to explain how and why it was bad. `Abdur-Rahman said: "It is imperialist." Khalidi asked him to elaborate. `Abdur-Rahman only said: "Very imperialist." With that, Khalidi moved on. I read (in An-Nahar) that Clovis Maksud spoke at a party in Washington, DC celebrating neo-conservative Lebanese-American, Walid Ma`luf. Clovis: have you lost your mind? Saudi King: letting his hair down in France. 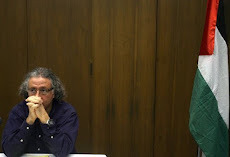 Jihad Khazin: on Farid Ghadri and Fouad Ajami. Whenever the Iraqi puppet government faces yet another political crisis, it announces a bunch of high profile executions. Speaking Abilities of Contemporary Arab Leaders. Politics aside, Isma`il Haniyyah is one of the best and most eloquent speakers in present-day Arab world. He has a very good voice, and has a tone that is rather unique to him: he has his own style, that is. Khalid Misha`al comes across as insincere and sneaky, without any oratorical skills. Abu Mazen, on the other hand, has the speaking abilities of Sen. Harry Reid (with even less charisma--if that is possible). Sa'ib `Urayqat comes across as somebody who is willing to say anything for a fee--or, to be fair--for personal advancement. Fu'ad Sanyurah thinks that you can compensate for lack of charisma by yelling when reading a speech, and by repeating the last sentence of any spech three times. Sa`d Hariri reads his speeches as if sedated, always. Mu`ammar Qadhdhafi does not speak: he mumbles, and is always on the defensive. Muhammad Dahlan speaks as if he is trying to sell a car without an engine or tires, but is trying to promote it as the best car there is. The Saudi King, well, let us hope he takes classes in reading and writing before we judge him. Hasan Nasrallah is also a gifted speaker: and is quite controlled in his emotional expressions. I think that he is at his best when he improvises. `Arafat was never eloquent or articulate: but has a great speaking voice, especially when he used to yell a speech. He can render a bad text into a well-sounding speech. George Habash in his prime was one of the best speakers I have heard. And he has a quality that is rare: he comes across as sincere--because he was, no matter whether you agreed with him or not. Anwar Sadat had great command of the Arabic language, and used it very effectively. He was very good in sloganeering. Muhsin Ibrahim of the Communist Action Organization was one of the best polemicists and pamphleteers of the contemporary Arab world: the Nasserist regime appreciated that quality about him during the Movement of Arab Nationalists. The late King of Morocco was a great speaker: he would quote Lenin and Qur'an in the same speech. He was quite eloquent. OK, I have to pack now. "In recent days, General Petraeus has sought to manage expectations in Congress and among the American public by emphasizing that his September report should be viewed as a snapshot of trends for an offensive that has recently gotten under way." "Pakistan is on the brink of disaster, and the Bush administration is continuing to back the man who dragged it there. As President Pervez Musharraf fights off the most serious challenge to his eight-year dictatorship, the United States is supporting him to the hilt. The message to the Pakistani public is clear: To the Bush White House, the war on terrorism tops everything, and that includes democracy." "'50,000 Iraqi refugees' forced into prostitution: Women and girls, many alarmingly young, who fled the chaos at home are being further betrayed after reaching 'safety' in Syria"
"He admitted 'Alafu' will not apply to Mohammed Dahlan, currently in the West Bank. 'He can never come back here. Everyone in Hamas is ready for Dahlan to return, and the supporters of Dahlan who do anything will be met with force.'" "if you seek to isolate Israeli universities then you must also include Berkeley, along with Columbia, in your boycott". OK. If you have other ideas for my boycott, please let me know. But most importantly, what business is it for you to comment on this matter? Oh, do you also want to comment on the Seven Points of Fu'ad Sanyurah? And what do you think of the surge? Turn on the lights, please. Wake up the children and release all the pigs from the barn. This is important. The puppet is angry. Repeat: the puppet is angry. "Karzai Warns NATO: Afghan Life Not Cheap." Nasser was effective in combating conservative and reactionary Islam when he stood for the liberation of Palestine and for the confrontation with western colonial powers and their clients in the region. Once his credentials on those issues were undermined in 1967, Saudi Arabia was able to successfully sponsor and promote conservative and reactionary Islam. Today, allies of the US think that they can combat fanatical fundamentalist groups while maintaining their lousy credentials on Palestine and on democracy and human rights. That formula will not work. Two days ago, Abu Mazen described Hamas as a "terrorist, criminal, and murderous" organization. He accused its leaders of treason. Today, Isma`i Haniyyah responded. He invited Abu Mazen to join Hamas in a national unity government. An issue of An-Nahar from August 25th, 1966, printed a plea from Fathi Yakan to Jamal `Abdun-Nasser to spare the life of Sayyid Qutb. On Augsust 30th, 1966, Al-Ahram carried the news of the execution of Sayyid Qutb (and two other leaders of the Muslim Brotherhood). The official statement said that "Islam is innocent of those deceivers [and] enemies of religion, and their refuge will be hell and worst of plights." The Jordanian government swiftly arranged for demonstrations in support of Qutb, and a Jordanian newspaper from the time declared the execution "a declaration of war on Islam and Muslims." (The Hashemites were sponsors of Muslim Brothers at the time). Even the secular Tunisian government praised Qutb and the Tunisian Mufti hailed his "struggle for Islam." Takfir and counter-takfir. Today, Walid Jumblat officially declared that those who are fighting with Fath-Al-Islam are "kuffar" (infidels). Jumblat promised to issue updates the state of infidelity in Lebanon. "As the U.S. offensive, code-named Phantom Thunder, has been greeted with a week of intensified fighting in areas outside the capital -- areas that the U.S. military has largely left untouched for as long as three years -- the push raised fears from security experts and officers in the field that the new attacks might simply propel the enemy from one area to another where there are not as many U.S. troops." "Nato responded by calling in airstrikes, which killed 20 suspected militants, but also 25 civilians, including nine women, three babies and the mullah of a local mosque, he said." "The House of Representatives voted Friday to withhold $200 million in military funds for Egypt until Cairo shows it is stopping weapons-smuggling from Egypt to the Gaza Strip and improving human rights abuses." Don't you like how they added the human rights phrase as an afterthought? "Most Palestinians polled — 59 percent — said they saw Fatah and Hamas as equally responsible for the infighting, and 71 percent said that both sides were losers." Khalil Al-Hayyah, a Hamas official, held a press conference today to talk about the captured documents from the Preventive Security headquarters. The press conference was quite worthless: he only spoke in generalities and about "we have documents to show" and then would speak in general terms or about unnamed states and unnamed ministers, etc. If you have those documents, you are obligated to release them to the public, and let Palestinian and Arab public opinion judge. The puppet clarifies: "Prime Minister Nuri al-Maliki said in a statement Friday that his objections to the US plan to arm Sunni tribal factions had been misunderstood. Not only does he approve of the plan, but he claims it was his idea in the first place." You can easily spot a brilliant mind when you see one: "The latest U.S. military offensive in Iraq should be judged not by whether it reduces violence but whether Iraqi leaders pass reconciliation measures, the top U.S. military officer said on Thursday. "If you try to define this in terms of level of violence, you've really put yourself on the wrong metric," Marine Gen. Peter Pace, the outgoing chairman of the Joint Chiefs of Staff, said at a Pentagon news conference with Defense Secretary Robert Gates." "The United States was intent to see the Hamas government fail. Not only did it work assiduously to block international funding, but it poured arms and money into militias controlled by the discredited nationalist forces that had lost the election. To add to the pressure, Israel refused to transfer tax revenues paid by Palestinians to the new government. A prime beneficiary of US largesse has been Muhammad Dahlan and his Preventive Security Force, which was decisively defeated last week by Hamas. Dahlan, who is about as popular in Gaza as Ahmed Chelabi is in Iraq, is Washington's man." The conspiracy. I came across an article in Haaretz last night (covered in an issue of An-Nahar) from July 1974 which talks about a meeting between Nixon and Rabin in which it was agreed that the Middle East priority should be a separate and comprehensive peace between Egypt and Israel. "U.N. Chief Shows Readiness To Side With Washington On Middle East"
""Psychologists were central to the abuse""
"Efforts are under way to get the Saudis to join future meetings like the Israeli, Palestinian Authority, Jordanian and Egyptian summit to be held in Sharm e-Sheikh on Monday, The Jerusalem Post has learned." "Earlier this week, a pro-Israel dovish group, Brit Tzedek v'Shalom, lobbied lawmakers to fund Abbas' Palestinian Authority." American columnists are now racing to give Israel ideas to punish the Palestinian civilian population. This is quite incredible, if you think about it. "...that the next Qassam will be answered with a cutoff of gasoline shipments. This should bring road traffic in Gaza to a halt within days and make it increasingly difficult to ferry around missiles and launchers. If that fails to concentrate the mind, the next step should be to cut off electricity." But why should you be surprised when a liberal Harvard law professor offers his own preferences of torture techniques. "New York, Thursday. Sen. William King, President of the American Palestine Committee, has issued a firm statement on reports that Jewish immigration into Palestine may be suspended. Speaking to a representative of the Zionist Organization of America, he said: "The report that a suspension of immigration into Palestine has been contemplated is incredible. That has been the prime objective of the Arab terrorists, and surely England will not disclose her weakness by yielding." "Residents of the West Bank settlement outpost of Adei Ad uprooted 300 olive trees belonging to Palestinian farmers about a week ago and replanted about half of them in the outpost, according to a source in the Civil Administration. The source said the settlers planted some of the uprooted trees along the outpost's access road and some inside the community." 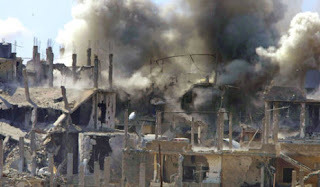 "In the first official Syrian comments on the matter, Shara said in Damascus: "We are not optimistic. The American president does not want peace between Israel and Syria."" Oh, yes, brilliant Syrian official. Israel is dying for peace but Bush is preventing it. "US predicts regime change in Zimbabwe as hyperinflation destroys the economy." Robert Chalabi is prepared to take over, and expectations are that he will be greeted with "sweets and flowers." Arab liberal dilemmas. How could anybody analyze the "phenomenon" of violence in the Arab world, without using the word "occupation" once. Not once. The entertainment value of Fox News is often underestimated by leftists. I do watch (or listen to on my satellite radio while driving) Fox News. Like where else would I learn, as I have just learned, about "the rise" of violent lesbian gangs in the US? Some of you thought that I was being unfair to Hamas when I lumped the movement in the group of parties that are responsible, directly or indirectly, for the carnage in Nahr Al-Barid camp. In An-Nahar's issue (of tomorrow), Usamah Hamdan (head Hamas official in Lebanon), said that the Lebanese Army "made military accomplishments" in the camp. Today N. Sarkozy said that he needs the Saudi king to deal with the misunderstandings "between civilizations." I agree. Once we teach the Saudi King how to read and write, he can play a hell of a role. By the way, does anybody know who was behind that flyer that was distributed in Gaza two weeks ago in which threats were made against unveiled anchorwomen? Nothing. I just wanted to introduce you to the Lebanese Minister of Interior. His name is Hasan As-Sab`. He is responsible for law and order in the Cedar homeland. Oh, yeah. Michael Oren has a new formula: it is Village Leagues. "The U.S., together with its Quartet partners, can work to establish areas of extensive Palestinian autonomy in the West Bank. Within these districts, local Palestinian leaders will be fully empowered to manage all aspects of daily life including health, education and resource management. A national assembly, comprised of representatives from each district, will meet regularly to deliberate issues of West Bank-wide concern. Security, however, will be jointly administered by Israel and Jordan." Talal Salman on the US high commissioner in Lebanon. 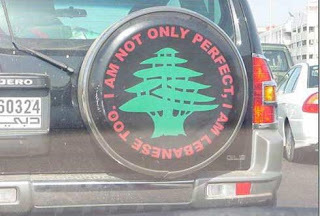 It must be cute, from a Lebanese point of view. Sunnis and Shi`ites, government and opposition, pro-Syrians and anti-Syrians disagree on a lot in Lebanon. But they all agree (I mean, all: Hizbullah AND Lebanese Forces) that it is good for "our" national esteem to allow the Lebanese Army to butcher Palestinian civilians. On LBC-TV, the Minister of Defense, Ilyas Murr (who promised to "teach the Israeli enemy a lesson" IF they enter Lebanese territory during the Israeli war on Lebanon) today said that the Lebanese Army is "more heroic" than any Army in the world. (He defined heroism by the number of hours dedicated to sleep per a 24 hour period). Marcel Ghanim on his program, Kalam An-Nas (LBC-TV) asked his friend, Minister of Defense, Ilyas Al-Murr: "To whom will you dedicate this victory of the Lebanese Army?" Yes, a victory. As much as the Arab armies achieved a victory in 1967. He also said that "the battle" has ended. The Army, he added, is now only "cleaning up." Did time pass by us? Days burdened by my longing. It starts. Where is the vague door? Return, or will it die? Wake up, Ye noble Arab"
Wait. Wait. Was this not the same logic of the Iraq experiment by Bush? "“Life in the West Bank at least economically, will improve and, we hope, politically will improve,” said Taher Masri, a former prime minister of Jordan. “Hamas in Gaza will look to this positive developments and wish they can join, which will lead elements outside Hamas in Gaza to moderate their position and to join the legitimate government." Nothing has damaged music and arts in the Arab world more than Prince Walid Bin Talal. Ever since he started his monopolistic Rotana company, the entire field of music production in the Arab world has now to cater to the lousy standards of the company which basically care only about: misogyny, sleaze, sexual commodification of women, internalized racism, and an attempt to live to Orienalist expectations. New TV reports taht `Amr Musa (after a three hour lunch) praised Lebanese food and described it as "delicious." Lies and fabrications: this time from American Jewish Committee. Nicholas Noe sent me this: "
a small but interesting issue for you with a widely circulated AJC advert which invents a quote by nasrallah - we have the speech from the actual arabic in my forthcoming book "Voice of Hezbollah" - and could not find it in the version printed by an nahar." (Book will be out by Verso, 2007). "UNISON, Britain's second largest trade union (1.4 m) voted overwhelmingly yesterday, 20 June, to support a cultural, sporting, academic and economic boycott of Israel and to support the Palestinian right of return whilst emphasising that the boycott doesn't mean breaking off contact with sympathetic Israelis." Who can better speak for the Arab people than a powerless appointee of the House of Saud? "“Abbas is accepted by all the Arabs,” said Muhammad Abdullah al- Zulfa, a member of Shura Council of Saudi Arabia, an advisory body with no legislative authority. “I think all the Arabs are with Abbas because all Arabs are with the peace initiative. The whole world is behind Abbas.”"
Syria is now bragging about Member of the Syrian (rubber stamp) parliament, Diyab Al-Mashi. The dude is around 83, and has been a member since 1954. He is being promoted for a Guinness as "the longest serving member of parliament" worldwide. Are Syrian media learning from rankings of An-Nahar's silly standards? And most importantly, it is not true. Sen. Robert Byrd, for example, has been in Congress since 1952 for example (after serving in the KKK of course). My sister is not happy with my passing criticisms of Lebanese Communist Party in my last artcile for Al-Akhbar, and my mother is not happy with my criticisms of the Lebanese Army. Yesterday, my mother said: I am dying to read you once writing a praise of somebody. I said: I did write in praise of Joseph Samahah when he did. She said: no, I mean praise of a regime or a political party. I said: you will not. Is there one regime or one political party that is worthy of praise? She said: that is true. I prefer this to winning a contest for foreign travel with Nicholas Kristoff. I read that Palestinian refugees in Jordan are angry at both, Fath and Hamas (as they should be). Prince Nayif of Saudi Arabia expressed his belief that the powers of the notorious moral police should be "expanded." "Osama bin Laden may have chartered a plane that carried his family members and Saudi nationals out of the United States after the September 11, 2001 attacks, said FBI documents released Wednesday." When your puppets are dissatisfied, you need to be worried. Very worried. "Top Iraqi Officials Growing Restless: Vice President Has Tried to Quit; Shiite Leaders in Disarray"
Today is a sad day in the Western and Saudi press. Oh, no. Not because Palestinian civilians are being killed by Israeli occupation soldiers and Lebanese Army soldiers but because a Kuwaiti diplomat was beaten up in Iran. A month of mourning will be observed now. The Palestinians need a new political organization: neither Fath nor Hamas. NOW. Peace is at hand. "U.S. to increase military aid to Israel in decade-long deal"
"The west has created fertile ground for al-Qaida's growth"
"A friend of mine, a Lebanese journalist, tells the following story:" His friend is Hazim Saghiyyah. Arab liberals adore Israeli Orientalists. In fact, if they can revive Raphael Patai, they would invite him to write simultaneous columns in Ash-Sharq Al-Aswsat and Al-Hayat. Pioneering Iraqi poet Nazik Al-Mala'ikah is dead. I am sick (the flu): I shall write something about her. In the meanwhile: search the archives. It is official. The PFLP (which has as much support among the Palestinian population as the French Communist Party in the last presidential election (around 1%) is now officially co-opted by the Abu Mazen-Dahlan gang. I heard today the PFLP official, Khalidah Jarrar, and she sounded like Dahlan. Also, the new Information Minister in the new Olmert version of the Palestinian cabinet of Salam Fayyad, Riyad Maliki: was he not a PFLP official? Here, an article about the courageous Nasserist MP, Usamah Sa`d, expressing disgust with leftist Palestinian organizations in Lebanon for their subservience to Hariri Inc. I still want to know who is behind the cruel kidnapping of the BBC reporter in Gaza. I in fact think that the same fanatical group holding the reporter is behind the cruel attack on the Church in Gaza (although the Saudi media are blaming Hamas, and we know how much Saudi media care about minority rights). Does anybody have information on this terrorist gang? When Fath Fights Back: "Israel fired missiles and sent tanks on a foray into Gaza on Wednesday, killing four Palestinians in the deadliest military action since Hamas militants took control of the coastal strip." A good analytical piece by Khalid Hrub on the Palestinian situation. I have mocked Lebanese obsessions with ranking. That obsession is best reflected in An-Nahar (the right-wing, sectarian Christian, anti-Syrian (people), anti-Palestinian (people) newspaper. Today, the publisher of the paper, Ghassan Tuwayni, said on NBN-TV: "I am the longest serving journalist in history." To that I say: go to sleep, Ghassan. Conspiracy? What conspiracy? "Strategy for Propping Up Abbas"
So you read the headline, and then you read the end of the story: "Hours later, Bush released a statement pledging to reinforce Israel's military posture with a new 10-year agreement "that will give Israel the increased assistance it requires to meet the new threats and challenges it faces." Bush said he will send Undersecretary of State R. Nicholas Burns to Israel next month to lead talks aimed at concluding such an agreement." "Bearing the stamp of Preventative Security, and marked "Highly Secret", the single dirty document on the ground instructed the reader to assemble information on one Abdel Rahman Salah Shadeh Karnua. But it was a rarity among the papers scattered among the detritus in the yard. Most of the secret files of the most hated - by Hamas - Palestinian security apparatus had been carefully collated and spirited away by the victorious Islamic faction after what had been the most decisive as well as the bloodiest engagement of the five-day civil war. Few of the hundreds more scattered documents were as tantalising, a salary slip here showing an officer's pay of 1800 shekels a month, a ripped and trodden-on photograph there of Rashid Abu Shbak, after Mohammed Dahlan, the Fatah security chief most demonised by Hamas's military wing." "Liberating," slowly. "It could take "decades" to establish an effective government in Afghanistan, the UK's new ambassador in Kabul admitted today." "He served as an intelligence officer in the IDF, studied Middle East affairs and military history at Tel Aviv University, and joined the Haaretz staff in 1955. He became a senior associate of the Carnegie Endowment for International Peace in 1984." So tell me. Does Carnegie also accept applications from people who served as intelligence officers in the Syrian Army or in Hamas or even in the Jordanian army? Or does Carnegie find Israeli intelligence officials more adorable and peaceful? "Asked if the Palestinian president, Mahmoud Abbas of Fatah, can restore his authority here, Mr. Hassouni laughed. “Abu Mazen?” he asked incredulously, using a common name for Mr. Abbas. “How? He’s gone.”"
You can't say that American don't care about foreign affairs: "The British royal offspring invaded American television on Monday, posting the night’s highest ratings and giving NBC an easy victory over all. Nielsen estimated that 12.2 million viewers tuned in at 10 p.m. to watch NBC’s “Dateline” interview with Matt Lauer and Princes William and Harry." In an Ottoman style decree, Abu Mazen ordered the dissolution of "the Executive Force" of Hamas. But how will he implement the order? Wait. I know how. He can simply send Muhammad Dahlan with his tough fighters and they can simply dissolve it, no? "...those who abandoned resistance and got intoxicated from the illusion of the marriage of power, and there they are getting jammed in a dilemma in which they imprisoned themselves in..."
""This pornographic campaign sponsored by the Foreign and Tourism Ministries is an outrage," lawmaker Colette Avital said yesterday in Tel Aviv. Avital, former consul-general in New York, was reacting to a Maxim magazine July photo spread titled, "Women of the Israeli Defense Forces." Eight months ago, Israeli consular officials here came up with a novel idea for changing the war-torn state's public image - at least in the eyes of guys with disposable income. "We have to find the right hook," consulate spokesman David Saranga told Newsweek. "And what's relevant to men under 35? Good-looking women."" "There is a reason the people threw out Abbas' Fatah party in last year's election. Palestinians see the leading Fatah politicians as unimaginative, self-serving and corrupt, satisfied with the emoluments of power. Worse yet, Palestinians came to realize that the so-called peace process championed by Abbas (and by Yasser Arafat before him) had led to the permanent institutionalization — rather than the termination — of Israel's 4-decade-old military occupation of their land. Why should they feel otherwise? There are today twice as many settlers in the occupied territories as there were when Yitzhak Rabin and Arafat first shook hands in the White House Rose Garden. Israel has divided the West Bank into besieged cantons, worked diligently to increase the number of Jewish settlers in East Jerusalem (while stripping Palestinian Jerusalemites of their residency rights in the city) and turned Gaza into a virtual prison." A new poll among Palestinians in Gaza and West Bank reveals the obvious: that most Palestinians are neither for Fath nor for Hamas: more than 40% of Palestinians indicated that they are "independent". "The army has also struggled to control civilian gunmen, some of whom claimed to belong to the Future Movement run by Saad al Hariri, who have also fired at the camp, at times shooting at Palestinian civilians and further inflaming tensions with the Palestinians." It is hard to tell if Hamas is more foolish than Hizbullah or vice versa. It could be worse than foolishness, of course. Saudi media are full of hostile articles against Hamas and Hamas officials still praise "the wise Saudi leadership." Killers, Murderers, traitors, fanatics, and usurpers. I watched a live transmission of Mahmoud Abbas' speech before the PLO's Central Council (is it not cute how the PA's puppet remember the PLO when it is convenient? They learned from the master, `Arafat). It was surreal. You really have to read the text or watch it. This weak and hesitant person, Abu Mazen--a man with no popular standing outside of Tel Aviv and Washington, DC--suddenly decided to sound strong and commanding. Did he not know that his master, Mr. Bush, is at his lowest point of his presidency, and that he has only few months to rule as president before the presidential competition marginalizes him further? I kid you not that he read from a speech that must have been written by an Israeli occupation official--and it probably was. With those puppets, it is a real possibility. He sounded like commanding generals in those famous Ba`thist military court trials: his enemies (Palestinian enemies) were consistently described as: killers, murderers, traitors, etc. This is from a man who once apologized for daring to refer to Israel as "the enemy." On what is he counting? On that "security plan" being prepared "by international authorities" which he made reference to in that speech? Don't you like those vague references when he thinks that he is fooling somebody? And he even talked about reforming mosques. That sounded like an Arab reform plan to me. Is democratic reform coming to Palestine now that it has established roots in Iraq and Somalia? And he talked about the fanaticism of the enemy: he who is supported by Mubarak and the rest of Arab kings and princes and that Sultan in Oman. He dares to criticize fanaticism? He did speak about the Israeli occupation but only referred to it as a footnote. A mere footnote to the narrative of Palestinian suffering. He faulted Hamas for not convening sessions of the Palestinian parliament-under-occupation forgetting that the speaker of parliament and some 40 members are sitting in Israeli jails. Hamas spokesersons are acting as they often do: foolishly and naively. A Hamas spokesperson wrote editorials in the Washington Post and the New York Times: thinking that if only we explain our case, they then would listen to us, and treat us fairly. Hamas operates from the same premise on which that lousy Palestinian leader, `Arafat, operated on. The notion that if we present our case well, the West will change its views. Let Hamas wait, and while they wait they will be going along the same path as `Arafat. I see it clearly. They will do the same: they will read from a faxed statement from the US government in which they condemn terrorism (as defined by Israel-always) and pledge respect and loyalty for Israel. Things are bleak? Yes, of course. But we are now more than 100 years after the convening of the Zionist congress in Switzerland in 1897 and the failure of Zionism is more clear than ever. In historical terms, it will be treated as a passing phenomenon in our region. People will be saying: Ben Gurion who? A Palestinian in Saudi Arabia receives 400 lashes for "trying to establish relations with women". The article said that he used the Bluetooth technology in his attempts.